Students: see our links to English-learning websites! Students--they are what teaching is all about! 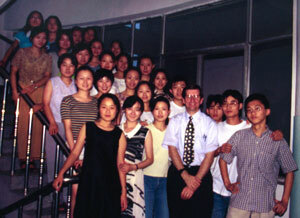 This is a rare photo of Michael's first class in China, way back in 1987. He taught for five months at the China Social University in Beijing. It was enough to "teach him" that he needed to know more about teaching! After this, he took a LONG train ride home, and started grad school. After a successful summer, Michael and the family moved to China the following summer to take a position in Shanghai. While Vivian worked on the monumental task of learning Chinese, Michael taught English in several ways, including corporate classes, evening classes, and Intensive English for children. 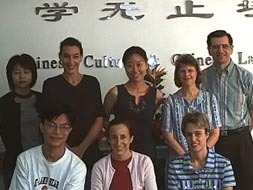 (right) Michael enjoyed catering to the English language needs of his classes at the Gate Gourmet international airline catering company (Shanghai 2000-2002). (Above left) These five adult students became our closest friends in SH (two now live in Toronto). 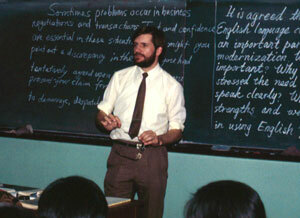 (Above right) Michael's first "survival English" class as an instructor for the Yew Wah Training Institute. 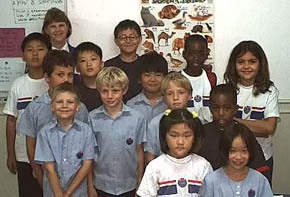 (Below center) Students enrolled in the Yew Wah/SIS Intensive English Program (IEP), where Michael served as both instructor and Academic Coordinator. Our difficult task was to take students with very little English and make them ready for classes with native speakers--in less than a year! (Below left) An SIS-IEP field trip to see the studios of Shanghai Cable TV. 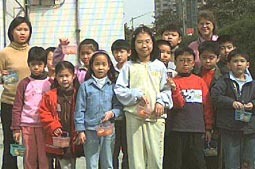 This spring 2001 trip was graciously arranged by our friend JinYu (next to Vivian), a Shanghai TV personality. When he wasn't busy with IEP students, Michael taught in several Shanghai schools, including Zhen Dan Middle School (below right). Michael also helped provide teacher training for the summer teachers. You can see more of our Shanghai photos by clicking "Shanghai Memories" below. (Left) This is one of Vivian's Victory Kidz Clubs--for SIS students like our son, Andrew (he is at the bottom left). (Center photo) Vivian's teaching career started by helping Yew Wah as a substitute teacher, but she ended up with her own classes! In Xi'an, she taught at the college level. (Right) Here are some of Vivian's Chinese Language classmates and teachers at FuDan U. Michael also took classes there one summer.